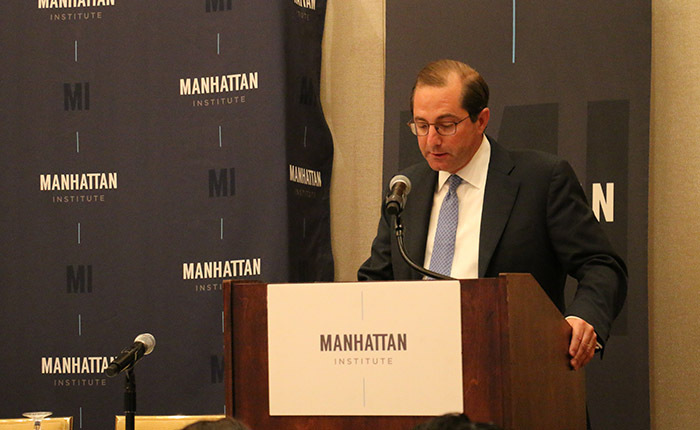 Thu, Nov 3, 2016 New York, N.Y.
Editor's note: Due to Mr. Azar's nomination as Secretary of Health and Human Services, audio from this event is now available (transcript). 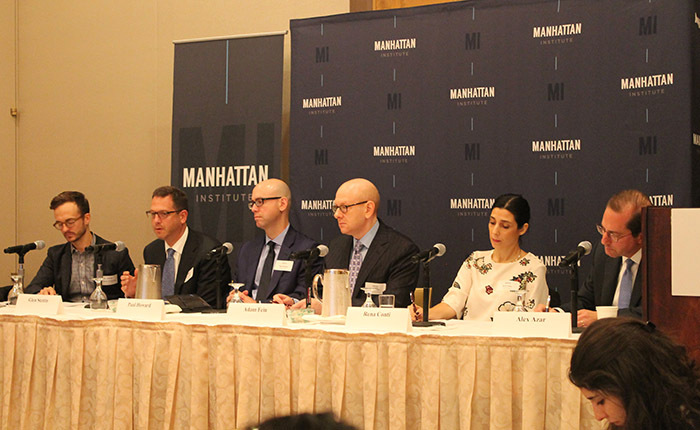 On November 3, 2016, the Manhattan Institute hosted a health-care symposium, featuring distinguished experts to discuss the forces driving drug pricing in America—and explore promising new approaches for making medicines more affordable for patients. The keynote address was delivered by Alex Azar, President of Ely Lilly. Prescription-drug prices continue to seize headlines this election season. Recent drug-pricing scandals—involving EpiPen and Daraprim, older medicines used to treat asthma and malaria, respectively, as well as high list prices for new medicines to counter hepatitis C and cholesterol—seem to offer ammunition to critics who charge that drug manufacturers prioritize profits over patients. But how are drug prices in the U.S. actually determined? Are the forces of competition being fully harnessed to yield positive results for patients? And how is high-deductible insurance, accelerating fast under Obamacare, affecting access to critical medicines? Federal drug regulations greatly influence drug-pricing decisions: for example, they mandate deep discounts for public-insurance programs, such as Medicaid, but can also discourage drug manufacturers from entering into innovative "pay-for-performance" contracts with private health insurers. Other regulations limit manufacturers' ability to exchange useful information with insurers and health-care providers—information that could lead to better patient outcomes at lower cost. FDA regulations reduce competition, too, driving up the time it takes new medicines to reach market. MR. PAUL HOWARD: Good morning. Good morning. It's working? Good morning. I'd like to ask everyone to take their seats, please. My name is Paul Howard. 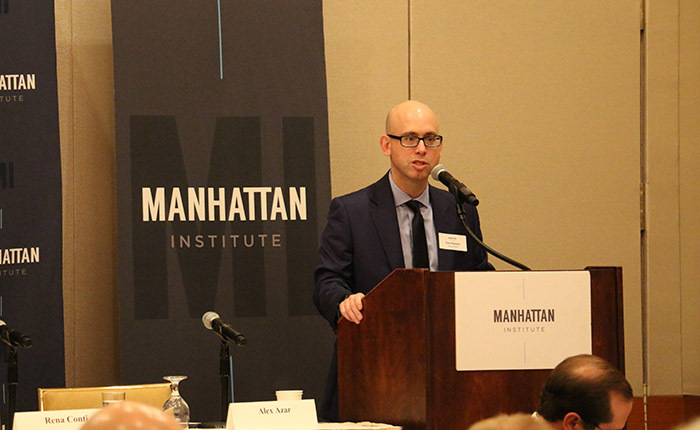 I'm a Senior Fellow and Director of the Manhattan Institute's Health Policy Shop, and I'd like to thank everyone for taking time out of their busy schedules this morning to join us for a discussion of a critical topic, drug pricing. What can we do to help keep innovation affordable for patients? It's probably not news to anyone here that drugs have become the indispensable tools of modern medicine. Before the advent of antibiotics, a scratch could kill and sometimes did. Childhood diseases were among the nation's leading killers of infants and children. Today, vaccines are so successful that many of the chronic or rather acute illnesses of the past, measles and chicken pox and the like, are unrecognizable to some doctors. Other medicines for chronic illnesses like diabetes, heart disease, and hypertension have helped slash death rates and complications from those illnesses, and helped us maintain our health as we age, saving our dignity along with our health. Of course the most astonishing revolution in the last 20 years or so, the development of antiretrovirals for HIV have transformed what was once an automatic death sentence into a manageable chronic illness for millions of Americans. As drugs have taken on an increasingly critical role in our healthcare system and in our day-to-day health, so have concerns about their costs, especially the prices facing patients when they go to fill their prescriptions at their local pharmacies, or receive their infusions at their local hospitals. From EpiPen to Daraprim and Sovaldi, both branded medicines and generics are facing increased scrutiny from state and federal policy makers for their pricing practices. Both the presidential campaigns from Donald Trump to Secretary Clinton have advanced proposals to help reign in drug prices and drug spending. In this context, we owe Alex Azar and Lilly a great debt. Alex is one of the most thoughtful and engaging speakers in the industry, and he's joined us today to share his perspective on what we can do to help make medicines more affordable for patients, without slowing the pace of innovation. He's also been gracious enough to agree to engage in a spirited discussion with our expert panel after his remarks. To borrow a turn of phrase, Alex isn't running away from a controversial topic. He's leaning into it, and for that we're deeply grateful. We couldn't have a better speaker to kick off our discussion. Alex has an extraordinary resume of experience. He's currently President of Eli Lilly USA, Lilly's largest global affiliate which is responsible for nearly half of its global revenues. His day-to-day responsibilities include direction over the entire US commercial business, including divisions addressing neuroscience, Alzheimer's, cardiovascular disease, pain, and perhaps of most interest to us today, it's managed health services. Before joining Lilly nine years ago, Alex was Deputy Secretary of Health and Human Services, the nation's largest cabinet department, where he oversaw as the number two COO, Chief Operating Officer, a staff of 66,000 and a budget of nearly 700 billion dollars. During his tenure at HHS, he oversaw the modernization of Medicare with the addition of the Medicare Part D drug benefit and the advent of competitive private plans in Medicare Advantage. He's seen both the private market and the public market, and has tremendous expertise and perspective. Please join me in welcoming Alex Azar. MR. ALEX AZAR: Paul, thank you very much for that overly kind introduction. One thing I've learned since I've been in marketing is you're supposed to under promise and over deliver. I'm afraid you've now been overpromised and I fear will be under delivered. So I'll do my best not to but thank you. Good morning to all of you. It's great to be with everybody here today on this absolutely critical topic. We've also got just an unbelievable set of panelists. It's rather imposing, frankly, to be delivering some opening remarks when each of these panelists frankly are more qualified than I am to be delivering them, but I look forward to a spirited debate once I wrap up here. We're all here, as Paul said, because we want to find a solution to high out-of-pocket costs of prescription drugs that are experienced by too many Americans. People are willing to pay for effective treatments but they don't like being gouged by dated generic drugs taking advantage of wrinkles in the system and the market. They don't like bearing an ever larger share of rising brand name drug prices before they go off patent. They don't like paying thousands of dollars in insurance premiums only to find that they must pay thousands more for the medicines that they need. It's the perceived disconnect between cost and value that has been generating such controversy lately. It's this cost/value gap that we at Lilly are determined to try to fix. In fact, Lilly was founded 140 years ago this year for exactly this purpose, to stand in the gap between the cost and value of medicines. When Colonel Eli Lilly decided to start a drug company in 1876, he was an out of work, failed entrepreneur. The smart business move seemingly would have been to make the hot product of the day, low quality patent medications. An entire industry had grown up in America mixing nothing but vegetable extracts, a lot of alcohol, and sometimes a little opium or cocaine for good measure, into an elixir, and then marketing it as a medical miracle. For $1 or $2 a bottle, which is about 20 to $40 today, you could buy cures for cholera, epilepsy, syphilis, even cancer; amazing, miracles. What you were just as likely to get was alcoholism, drug addiction, and in too many cases death. Quality control in those days was virtually nonexistent. Meaning you could easily end up with the wrong medicine or wrong dose with disastrous consequences. Drug companies are often criticized today but imagine an entire industry making plump profits selling risky medicines using blatant lies. Colonel Lilly, however, fought back. He founded his company on the idea that only pure ingredients would be used, and he set up labs to test every single compound that Lilly purchased before using it to make medicines. He shunned the miracle claims about his products and as a result he sold only through trusted partners; wholesalers, physicians, pharmacists who shared his belief in scientific medicine. That strategy was not only successful financially but it was prescient when 30 years later congress passed the Pure Food and Drugs Act of 1906, essentially requiring all drug manufacturers to follow that example of Colonel Lilly. Within a decade, nearly all drug companies were turning out reliable, high quality medicines. That eliminated much of the risk of unintended death, drug addiction, and alcoholism. There was still the problem of efficacy. Most of the medicines a century ago provided little benefit to patients. Largely as a result, the average American man in those days lived just 54 years, two decades less than today. So Lilly's son, J.K. Lilly, fought back. A trained pharmacist, J.K. had worked at his dad's company since the age of 14, but late in his career he realized the company needed a new way to bridge this cost/value gap. Lilly began hiring top flight researchers from the academic world to discover new treatments. Lilly partnered with outside scientists such as a pair of Canadian researchers who discovered that insulin could spare diabetics from death. Lilly was the first company to bring insulin onto the US market in 1923, and from that time on finding breakthrough drugs that had a truly beneficial effect was the name of the game in pharmaceuticals. The addition of efficacy to FDA regulations and statute in 1962 was more an acknowledgment of what companies like Lilly were already doing than something new. Today, we're on the cusp of a golden age of pharmaceutical breakthroughs. Helped by the full sequencing of the human genome over a decade ago, something that I got to witness close up at HHS, biopharmaceutical companies have recently brought to market new therapies that push off deadly diseases for months and years, and in some cases forever. New Hepatitis C drugs are now curing 90% of patients and sparing many of them organ transplants. There have been 70 new oncology drugs approved in just the past 5 years for treating 20 different tumor types. These include new immunotherapies that harness the body's own immune powers to attack some of the hardest to treat cancers, bringing hope and extending life for patients. These medicines offer the most valuable thing in the world to patients, time; time to work longer, time to be with their families longer. Here is the problem. Our outdated system for paying for prescription drugs is threatening to squelch patient access to this recent and revolutionary burst of innovation by shifting a crushing burden directly onto individuals. In other words, we're trying to usher in a golden age of medicines with a payment system that is in its golden years. That system needs to be retired and replaced. The only way to do that is for every private healthcare institution, drug companies, insurers, employers, pharmacy benefit managers, hospitals, to work together to create a better way to pay for medicines. Just as Colonel Lilly worked with physicians and pharmacists in the 1870's, just as J.K. Lilly worked with academic scientists in the 1920's, we today are committed to work with our payer and provider partners to create a new system that both protects patients while at the same time encourages innovation. Everybody in the private healthcare sector must come together to fix how we pay for medicines because, if we don't, others very well may fix us. For the remainder of my time, I want to cover three things. First, I want to briefly describe the current and incredibly complex US pricing system and why it's breaking down. Second, I'll sketch the outlines of a better system, even though it will take lots of experimentation and learning by all of us in the healthcare industry to get to a final comprehensive solution. Third, I'll suggest key steps that we can take to move toward that new and better system. So about 25 years ago we fell into a system of pharmaceutical rebates which worked fine, so long as insurance plans exposed patients to only limited cost sharing. Drug companies would settle this price for a medicine and they'd sell it to pharmacies at that price. After a pharmacy dispensed that drug to the patient, collecting a modest copay, the patient's insurer or pharmacy benefit manager that the insurer hired would pay the balance of the list price to the pharmacy. The insurer, or the pharmacy benefit manager, would send proof of that payment to the drug company, which would then send a rebate check of 5% or 10%, maybe even 20%, back to the insurer or the PBM. Drug companies offered these rebates so that insurance plans would make their medicines more accessible to patients. A larger rebate usually secured you a better placement on the insurer's or PBM's formulary, which meant patients pay less out-of-pocket for your drugs. The terminology was called "buying down the copay." The only problem is that nearly every player in the industry--and this is not to fault any player in the industry, it's simply a statement of the economic facts. All players, wholesalers like McKesson and Cardinal, pharmacies like CVS and Walgreens, pharmacy benefit managers like Express Scripts and CVS Caremark, and drug companies, make more money when list prices increase. The fees that middlemen in this channel charge are based on a percentage of list price. So higher list prices generate more fees. If drug companies set their list prices higher, they have more room to offer larger rebates, to win better formulary placement from insurers and PBMs. It's those list prices that have generated all of the recent controversy. You've heard that drug prices increased each of the past two years by 12 and 13%. Those are like talking about rack rates on the back of your hotel room door. I mean take a look at it the next time you stay at a hotel. It's probably 500, 600, $1,000 more than what you're actually paying for that room, thank goodness. It's the same with drug prices. Net prices, after drug companies doled out more than 130 billion dollars in rebates, grew just 2.8% last year. They've been growing fairly modestly for several years now, as drug companies raise their rebates nearly as fast as they've been raising list prices. No patient was ever supposed to pay those list prices but in recent years a growing number have been forced to do exactly that. Why? Because of big changes in how health insurance benefits are designed. One out of every three Americans with private health insurance is now in a high deductible plan, myself included. The average individual deductible has quadrupled in the past decade and the average deductible for family coverage is now $4,000. The number of plans that have a separate deductible for medicines from medical benefit has doubled from 2012 to 2015, from 23% to 46%. These and other practices make health--make health plans heavily biased against prescription drugs. Insurers make the average patient pay 5% out-of-pocket for hospital and physician services but 20% out-of-pocket for drugs. Until the patients spend the full amount of their deductibles, they have to pay the full list price for their prescriptions. Instead of using the rebates that pharma pays to reduce that exposure for the medicines, the way it happened when originally conceived, that buying down of the copay, the third party payment system now uses that rebate stream either for profitability of players in the channel or to keep premiums lower. Okay? That practice exposes patients to huge amounts of cost sharing when they walk into the pharmacy. That's the problem that we've got to figure out a solution to together. Insurers and PBMs are not to blame. We do not get anywhere by trying to point fingers at each other and trying to impugn each other's motives in this. We are working within a system that has forced various players into ways of interacting. The unfortunate victims of these trends are patients, so we've got to create a better system. So what would a new system look like? Well, I think it has to have three broad elements. It's got to pay for value. It's got to protect patients, and it should promote competition. So biopharmaceutical companies in most cases price our medicine based on the value they deliver to the healthcare system. That's at least in principle we aim to try to do. Do we always succeed? Of course not, but that is the goal. We need a system now that pays based on value too. So, contrary to popular belief drugs are not the cause of high healthcare costs today, they're actually the answer to them. United Healthcare showed this clearly in an experiment that it ran from 2009 to 2012. It promised oncology physicians a bonus if they provided high quality care that reduced overall spending on their patients. The doctors actually delivered. They successfully reduced overall spending on their patients by 33 million dollars, but to help them reach that goal the physicians actually increased spending on prescription drugs by 13 million dollars. So they had to raise their drug spend to reduce their overall spend, and they still came out with a 3 to 1 ROI on that one. The authors in the article at the end of it--basically the concluding paragraph is fascinating--they say, "We have no idea how this happened. We don't understand this." I've got an idea. Drug companies often price their medicines based on exactly that kind of system wide value. Let me give you another example. When the breakthrough Hepatitis C drug, Sovaldi, came on the market, which unfortunately Lilly does not own, it cured 90% of patients. It had the gulp inducing price of $84,000, but this is a drug that saves a patient from a $300,000 liver transplant and from a $64,000 course of drug therapy, for a drug that costs $84,000. Not a bad economic proposition just if you do the math. Right? Unfortunately our third party payer system today isn't set up to recognize these kinds of savings. Most health plans keep their spending on medicines completely separate from their spending on hospitals and doctors. PBMs are instructed to keep spending on drugs low. That's their job. That's their scorecard. That's their contract with their client plans. So they don't get visibility into whether their practice of restricting patient access to say higher cost medicines results in higher or lower spending down the line on the medical side of the benefit package. A lot of employers actually contract completely separately. Health benefits here and a separate relationship with a PBM for acquiring here; total disconnect. It's crazy. It's like driving the price of motor oil down aggressively and restricting how often you can go to a Jiffy Lube station. It would save money on oil changes but the cost of major car repairs is going to go up. Drug spending is only about 15% of overall healthcare costs and it has been stable at that 10 to 15% level for 50 years, but that spending on medicines help contain the other 85% of healthcare spending. So health insurers and employers need to change the structure of their health plans, as well as all the incentives that they give PBMs, so they can reconnect what they pay for drugs to what they pay for everything else. Health plans have got to remove the internal bias they have against prescription drugs that are inherent in their plan designs. They can also reward value by moving away from our current system that pays strictly per script. We've signed multiple value based contracts with insurers that require us to pay larger rebates if our drugs don't deliver value, but they reduce our rebates if our drugs produce better outcomes for patients or fewer expenses for payers. We're willing to put our money where our mouth is. To make these value based contracts easier to do, we've been working with the large health insurer Anthem, our neighbor in Indianapolis, to call for such policy changes as safe harbors in the kickback statute and the Medicaid best price rules. Uncertainty in both of those regulatory regimes currently make value based contracts difficult to execute and very difficult to scale up, and almost impossible to put enough money at risk to make them genuinely value based. What would also enable more value based contracts would be more systemic collection and sharing of real world evidence by healthcare providers. If we all had better data readily available, we would more easily be able to determine which drugs and which indications are truly producing great outcomes for patients. Payers could then reimburse us accordingly. More broadly, all of us involved in the pharmaceutical industry should work to create agreements that no longer rely on list prices to determine our revenue. So long as list price is the basis of value in our industry, all of us will have a reason to keep list prices high, and more and more patients will be hurt when they walk into the pharmacy. Until we fundamentally fix this outdated system, we can do many other things to protect patients, however. Our internal research shows that about 10 to 20% of patients with private insurance are exposed to paying more than half the cost of brand name drugs with prices over $100. That means that a significant number of people who already paid premiums for their health insurance then end up paying more than their insurer does for a medicine. That's not good for people's health. Numerous studies that we've done and others have done have shown that when patients have to pay more than 50 or $100 to fill a prescription huge numbers of them simply walk away. That renders them less healthy and more likely to rack up a big bill later on. So it's in everybody's interest to keep out-of-pocket costs for drugs at less than $100 per month. Let me give you a couple ways that we could do that. First, drug companies and PBMs should work together to make the rebates that we pay available to high deductible patients at the point of sale. People in high deductible plans are forced to pay the list price for drugs until they meet their deductible, even though the PBM and the insurers still collect a rebate from the drug company for that script. That just doesn't seem right to me. Second, for high deductible plans with health savings accounts, the IRS needs to provide clear guidance on what kinds of medicines count as preventive services and therefore are allowed to qualify under the Affordable Care Act and under the tax code for first dollar coverage. Right now, many insurers and employer health plans don't want to run the risk of providing upfront coverage for certain chronic and lifesaving medicines, such as insulins or statins, out of fear that the IRS will then rule them ineligible for coverage, but those are the drugs that produce the most savings on other healthcare services. Third, employers could help by doing upfront funding of HSAs for high deductible plans. Right now, only two-thirds of Americans who have HSAs receive money in their accounts from their employer. I am very fortunate that my employer has done that with our own healthcare plan and we've kept our medical spending growth at under 5% per year ever since. Fourth, consumers and employers should demand that their health plans exclude from deductibles prescriptions that have met prior authorization requirements. If a patient, the patient's doctor, and the health plan have all agreed that a patient needs a particular medicine, it makes no sense then to let a high deductible prevent that patient from getting that drug and adhering to that medicine. It's going to lead to non-adherence by the patient and it's going to lead to higher costs later for that health plan. It is not why we create deductibles. Fifth, we need to ensure that the sickest and neediest patients are protected from various players that may use benefit design and drug coverage choices to implicitly discriminate against beneficiaries with certain health conditions. That's actually when we did Part D in Medicare, that's why we created the so-called six protected classes. They were to prevent plans from being able to discriminate against individuals who have HIV, AIDS, or cancer, or mental health patients, to try to cream skim the beneficiary pool and impact your risk basis in your plan. We need the same kind of protection in other individual markets. Finally, I believe we should allow the use of copay card assistance for participants within Part D and Part B. Under our current anti-kickback statutes interpretations, this is effectively not allowed. With the stroke of a pen, the government could allow millions of patients to access a host of copay assistance programs within their Part D or Part B coverage. I understand that most health insurers don't like copay cards but because our payment system incentivizes all players to prefer higher list prices, as I described already, copay cards are really the only direct way available to drug companies to lower prices for individual patients at the point of sale. So as we shift to pay for value and protect patients, we cannot forget that we also have to promote competition, because competition is still our best tool for holding down healthcare costs and anywhere else. Again, Sovaldi provides a great example of the power of competition. Within a year of Sovaldi's launch, a competing Hep C drug hit the market. Discounts offered on Hep C drugs now run about 50% or more, making those drugs less expensive in the United States than under the socialist price controls in Europe. To stimulate this kind of price reducing competition, insurers and PBMs should return to their traditional policies of presumptively covering all new drugs and then do class reviews once real world evidence is available. By encouraging more competition, this practice would in the long run boost PBMs negotiating leverage with drug companies for rebates. I simply do not understand why now many PBMs are declaring winners and losers at launch, before there is any clinical practice, any information. If I were in their shoes, I'd want to build up share of multiple competitors and pit them against each other, but that's not the current practice. Also, the FDA has got to clear out the backlog of generic drug applications. An FDA has got to institute new ways to speed up the development and approval process of new therapies. The best way to benefit patients and control costs is to make pharma executives like me compete tooth and nail with as many similar drugs as possible. Finally, we've got to keep the private health insurance system thriving. As much as we all like to criticize our health plans, they are vital to medical innovation that has made our lives so much better over the past century. When insurers are competing for patients, they are motivated both to cover new treatments and to control costs, but state run health plans, which don't need to compete for patients, usually control costs by not covering new treatments or by paying poorly for them. That kills innovation. One of the most pressing orders of business here is to fix the Obamacare markets or replace them with something better. Democrats and republicans, even President Obama, now acknowledge that the Obamacare markets are not working. When you have the most sophisticate insurers in this country such as United Healthcare and Aetna losing hundreds of millions of dollars and fleeing these markets, you just know something is not functioning. If we do these three things--pay for value, protect patients, and promote competition--we're going to get the system that we all want; a steady stream of innovation that's rewarded for moderating overall healthcare spending, and that comes at a modest out-of-pocket cost to patients. What would be a mistake, however, is to turn to government price controls, to patch the cost/value gap. It's tempting to gravitate toward public policies that are sold as silver bullets like Medicare price negotiations or importation of medicines from other countries. It wasn't government that first saved patients from harmful patent medicines in the 1870's. It was entrepreneurs like Colonel Lilly. It wasn't government that began the movement to scientific breakthroughs in 1920's. It was visionaries like J.K. Lilly. Today it won't be government that solves the cost/value gap created by our outmoded payment system. Rather, the solutions lie with each of us in the healthcare industry. Let's avoid the temptation to point fingers at one another for the harm that patients are experiencing. Instead, let's work together to move away from the 20th century payment system, to one that delivers on the promise of 21st century innovation. Let's not wait for the government to fix our problems. Government can help sometimes at key junctures, mainly by removing hurdles, but Lilly didn't wait for the Pure Food and Drug Act to make pure drugs. Instead, he found private partners to protect patients. J.K. didn't wait for the FDA to start requiring efficacy. Instead, he found partners to heal patients. Today, we're not willing to wait for a new act of congress to fix the current cost/value gap. Our entire company's history demands that we look for partners to develop solutions to the problem and do it now. 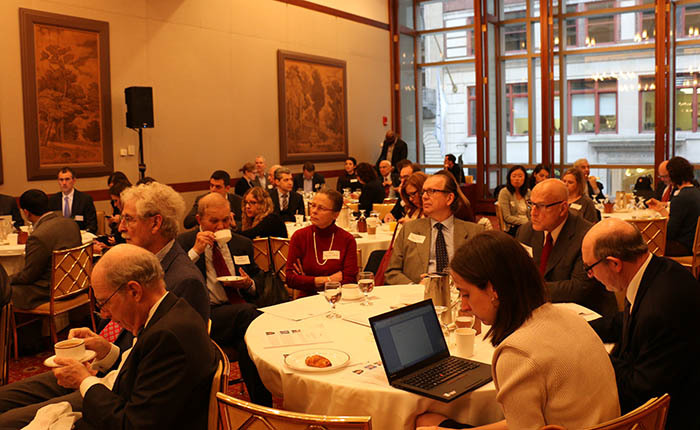 So we ask all of our partners in the healthcare industry, insurers, employers, PBMs, hospitals, and patients, and policy makers, to join with us to solve the challenge of our day. Let us all create a new patient friendly way to pay for today's breakthrough medicines. Thank you very much. MR. DREW ARMSTRONG: Alex, thank you very, very much for a really wonderful and interesting speech. We've spoken before and we've talked about some of the same issues. It's always really nice to have a candid discussion about some of the issues facing the healthcare system, especially as it relates to drug pricing. Thank you very much to the rest of the panelists. My name is Drew Armstrong. I am the Healthcare Team Leader at Bloomberg News here in New York. I cover our pharma coverage, insurers, the healthcare system. It's a real pleasure to be up here with a lot of our distinguished panelists. I will keep our introductions brief. The idea here is to have a relatively informal talk. One of the first things we'll probably do is discuss some of the points that Alex made in his speech. 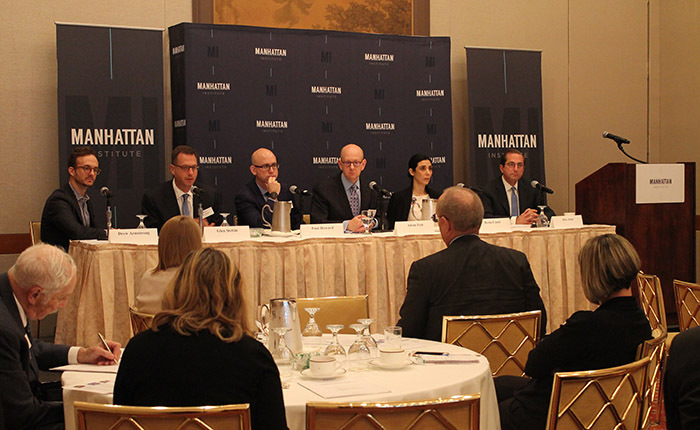 So just going from my left heading on down, we have Glen Stettin here from Express Scripts, who is the Chief Innovation Officer over there; Paul Howard from the Manhattan Institute; Adam Fein from Drug Channels; Rena Conti from University of Chicago; and last but not least here, Alex Azar from Eli. MR. GLEN STETTIN: You didn't intentionally put us this far apart, did you? MR. ARMSTRONG: Perhaps you can start us off. I'll give you some breathing room in terms of time here. Broadly, what is your take on how we should be revising the healthcare, the payment for pharmaceuticals in this country, or not, perhaps? MR. STETTIN: Sure. So I'll start off by saying I think several things that are unfair in how prescription medicines are priced today. One of them is exposed through the Affordable Care Act, which has actually required insurers and employer sponsored plans to combine the medical and pharmacy components of their plans and their deductibles. So previously patients were not exposed to first dollar coverage with deductibles to a great extent, as you heard earlier. As more and more patients have entered into these plans, they've been exposed to the list prices for these medications. The plans had not been structured for how to even think to pass on the plans discounts, which are collected in the form of rebate much later in the process, not at the time the medication is dispensed at the point of sale, at the point of service. I totally agree we have to think through how we're going to solve for that, to take care of patients who are exposed to prices for medications that they truly need, at the time that they need them and can't afford them, even though that they have insurance. The second thing I would say that's not fair is the fact that in the United States we bear the world's cost for innovation of new medications. Right? Drug prices in this country are higher than they are in other developed countries, Western Europe, Japan. We have to do something about that. You heard the example of Hepatitis C medications and Sovaldi and Harvoni, which are $85,000 a year. Well, those prices didn't come down to $40,000 a year by themselves. We at Express Scripts went with the AVI product, Viekira Pak, the day that it was launched to market. We took advantage of the fact that there was competition in the marketplace and pitted the manufacturers against one another. We had our customers behind us, the employers and health plans that pay for prescription drugs, that gave us the leeway to exclude Harvoni from coverage. People thought that we were crazy when we did that because Viekira Pak needed to be taken two times a day instead of Harvoni, which could be taken one time a day. Viekira Pak had drug interactions that could potentially make the medication unsafe. Well, we figured out a way to screen out and not have that apply for people who had potential drug interactions, and we had pharmacists who specialized in the treatment of hepatitis C and counseling patients to improve adherence. We proved, not only to the surprise of the manufacturers of the original products, that we could deliver the same rates of adherence, the same actually slightly higher rates of cure, for therapy that took only 12 weeks to complete. As a result, we were able to get most of our customers to withdraw restrictions. They previously at $85,000 a year, all they could afford to do was treat the people with the most severe liver disease. Who would want to live with a virus inside them that could cause liver cancer or cirrhosis and liver failure, and not get treatment because you have somebody saying that your infection isn't severe enough yet? So the fact that we were able to bring the prices down, it didn't happen by itself. It happened by leveraging competition. Some of the ways that we can get to leverage competition are having the FDA approve medications, particularly medications, the second, third, fourth drug in the same therapeutic class, faster; so that we can leverage competition. We also need a better pathway for biosimilar medications, essentially generic versions of these biotechnology drugs, these very expensive high cost medications, to have the ability for pharmacists to substitute, just as pharmacists can substitute a generic medicine for a brand medication in the smaller or traditional--the smaller molecule traditional medications. MR. ARMSTRONG: Paul, I want to give you a chance to weigh in here from a little more of an outside perspective than the two guys who are sitting across the table negotiating from each other at some point or another I'm guessing. MR. HOWARD: I think there is a lot to agree with both what Glen and Alex said. I think the really interesting challenge here is the med question for the US is something like this. Healthcare costs go up faster than GDP growth, go up faster than wage growth. In that situation, especially when you're looking at state Medicaid programs, the danger is that those healthcare expenses are going to crowd out other public priorities, even other health priorities. How do you address that? I think the real challenge here is who owns the patient and takes responsibility for that outcome, and then can arbitrage the fact that, yes, this medicine prevents a $300,000 liver transplant later. The system that we're in today still is fragmented that it's difficult to point to that. I agree with Glen, I think the other thing is allow more of these innovative contracting designs to come out. Currently, I think as Alex alluded to, Medicaid Best Price inhibits private payers from negotiating perhaps some of the value contracts they might otherwise with innovative companies because the manufacturers are worried about what implications that could have for the entire Medicaid market, which is an enormous program. So I think that that's some place to start, and start thinking about how do we move patients out of the crosshairs and get the networks competing around the value they deliver. MR. ARMSTRONG: Adam, I'd be curious to hear you weigh in here. Do you think we end up in any kind of roundabout way getting to some kind of value? Let's say we talk about the Hepatitis C example. Looking at where we are now on pricing, since Glen and Alex both brought that up, are we closer to a paying for value kind of situation there at all? MR. ADAM FEIN: I think Alex laid out the issues pretty well. The challenge of paying for value is defining value and then actually figuring out how you're going to actually do the contracting on that. The system is very fragmented and it really wasn't set up to pay for value. I would just add one more point. I think Alex laid out very nicely the challenges to the system, the burdens being borne by the patient. To some extent the system we have now, the pharmacy benefit system which really developed in the '80's and '90's and was driven by this wave of primary care blockbusters, that world has sort of disappeared. The primary care blockbusters are vanishing from the world and we really have this bifurcation of the industry and I'd argue also of the patient. We have essentially nine out of ten prescriptions being a relatively low cost generic going to a very large patient population. The frontier of innovation and where the costs are going fastest are these more specialized therapies for very small patient populations, often very targeted therapies that might treat literally thousands of patients. The cost is very challenging. Part of the problem of paying for value is you're trying to use the system we've developed for this primary care system to pay for these relative low cost products which frankly you may not even need insurance for, for a $10 a month prescription, versus this extremely expensive care we want to provide to people who are very sick. We end up creating insurance designs that are discriminatory, I think as Alex highlighted. We have trouble negotiating that because there is no one who is in charge of that patient and there is no way to think about how do we deal with that person and what is the nature of insurance. I think that's kind of what we're bumping into. Simply saying let's import drugs or let's do something, as Alex alluded to, is not going to get at what is a fundamental shift in what the pharmaceutical industry is and what even the nature of pharmacy benefit insurance has become. MR. ARMSTRONG: Rena, maybe you can respond to that. How do we bridge the gap between that old world of primary care drugs where we had a system that worked relatively effectively in creating competition? Alex was talking about these frontier drugs versus a specialty world where, yeah, to Adam's point, where we have many drugs that are applicable to small groups of patients and there may be limited amounts of competition. How do we get between those two worlds? How do we use the old system? How does the old system need to change to be reflective of the new reality in how drugs are developed and used? MS. RENA CONTI: So I actually think that there are two issues here. The first is we don't really have a system that is set up for paying for cures, particularly when these drugs are affecting populations that are actually quite broad. I think we saw this with Hepatitis C but frankly there will be other drugs that are coming along the pipeline such as those that treat Alzheimer's or ALS, where demand is exceptionally great. The spillover effects for families but also for productivity more generally are enormous. Pharma can be rewarded for that and to a certain degree given our current system, but commercial insurers and also Medicaid programs will never be able to afford those costs, likely, and will be very tempted to ration because they're bearing a short term cost and the implications are long term. So how we do that, how we deal with those type of drugs, I think we need to think outside of the box. I have some ideas about how to think about that. Secondly, I think there is another set of drugs that are also really challenging, which are drugs that treat infectious or conditions that are really public health threats. So a great example right now are drugs that treat the opioid addiction, where rationing access to care for those therapies, similar to rationing access to the mental health drugs from the '80's and '90's, fundamentally harms patients, fundamentally harms their families, but also again doesn't do great things for employers or for the system as a whole. Again, commercial insurers and the Medicaid programs can only do so much to handle those type of those finances, and also make sure that people actually get that care. We need to think it through other ways of financing. MR. ARMSTRONG: I want to take one of the points, one of the first points you made, and throw it up to the panel. I'll let people jump in as they see fit. The idea of who captures long-term value. I think it is an incredibly important point that you raised, the idea that we have medicines that will be used and paid for in the very short term, and then create value for payers in the very long term. Some of those cases, it's going to be a private payer that may pay for the medicine and it will be a public payer--Medicare, years later--that might capture the value when a patient doesn't have an event. I hate to use the Hepatitis C example over and over again, but it's a slow moving disease for many people that the cost is going to be borne almost entirely upfront by an Express Scripts or an insurer. Then the result will be that 30 years later or 10 years later or 5 years later, when that person is likely under a different insurer, especially in the Obamacare exchanges where people are being encouraged to shop year-to-year, somebody else is going to capture the benefit of that. How do we design a system that allows the people who pay for the medicines to actually capture the value to the healthcare system of those medicines along a longer timeframe? I'm open to anybody who wants to jump in here. I see Glen. Glen looks like he has a few ideas. Let me let him start. MR. STETTIN: I'm going to just give the analogy of potholes. Right? If you take a busy street here in Manhattan and you fill in a pothole, I guarantee you will save millions of dollars from damaged vehicles. Right? We would never think of paying millions of dollars or even tens of thousands of dollars to fill a pothole. I think when we talk about capturing the long-term value, we have a situation where the value primarily accrues to the patient and their families. We certainly want that. We also have a system where it's subsidized. Except in this deductible phase, the bulk of the payment is borne by others than the patient themselves. Right? So it's inviting, the other analogy, the football team to come to the buffet. Right? All you can eat buffet. We have to sort of figure that out. So we think that the best way is to have more opportunities for competition and then leverage that competition in the market not for so much completely capturing value but to compete on price. For people who can afford it to have some skin in the game because they are deriving value from paying for their medication or the benefit of their medication. I think what you're seeing with the Affordable Care Act and putting the deductible and all of that together is more people are actually buying down their insurance. They're choosing less expensive options because they probably were over insured before. I think that we certainly need some tweaks. We need to take care of the expensive medications in the deductible phase of the benefit, but the primary value goes to the people who use the medicine, not to any system, not to any other party. We have to think about a way that if people had to pay for all their medicines out-of-pocket we'd have two problems. We'd have people not use their medicines if they couldn't afford them. We also would not have the innovation. So we have to create motivation opportunity for the pharmaceutical manufacturers to generate returns on their investments, but we have to do it in a way that still makes healthcare affordable and the US not paying for the bulk of innovation around the world. MALE VOICE: Just I think it's interesting to look at places where the market has worked well. I think a couple of the speakers have said, look, for generic medicines by and large, with some notable exceptions that we all know, it works pretty well. We can improve the efficiency there and we should. You look at say the first gene therapy, which I think was approved in Europe, Glabra, which costs several hundred thousand dollars a year, hasn't been uptake for that product because it's not I think truly curative. I think some of the new frameworks that are coming out, we're just going to have to think really differently about how those are paid. I think some innovators have suggested perhaps an upfront cost, an upfront payment, and then a licensing fee for as long as the product continues to remain effective for some period of time that would be affordable for payers. I mean the challenge I think in any system, but particularly for drugs given the long challenges of development and risks, is that when you have a drug that say keeps someone out of the hospital, the hospital doesn't in turn say, "We've lost that revenue. I guess we're going to have to lower our prices or so something like that." The competition at the level of the provider I think needs to change around how well and how efficiently they're delivering those services, and how can others compete. Obviously freestanding physician associations can compete with hospitals based on that value and arbitrage the difference in their capital structure and say, "We can keep you out of the hospital. We can lower costs for insurers and lower premiums for employers." That then becomes a sustainable prospect that's not loading more costs onto patients. MR. FEIN: I mean can I just build on that point? I think Alex brought up this point. 85% of healthcare spending is not drugs. Most of that is healthcare services, which are essentially people delivered services by a physician or a hospital. Unless I missed it, I haven't heard any of our leading presidential candidates discuss anything about healthcare except for drugs. You could eliminate the entire 15% of drug spending and you wouldn't solve the healthcare cost crisis. So it's kind of a false analogy to focus on it and it also makes me think about some of these I'd say false comparisons. Yes, you could look at Europe and say drugs are cheaper in Europe. You know what else is cheaper in Europe? Physician salaries are half to a third of what they are in the US. Healthcare services are a lot less expensive. Everything is more expensive in the US, not just pharmaceuticals. That's all we talk about. So I think there is also some of these analogies that are not accurate. MALE VOICE: I would say, Adam, part of the reason we talk so much about pharmaceuticals is that as part of the health benefit 65, 70% of the people use pharmaceuticals in every given year. We've had this very rapid exposure to patients to list price in the last several years. MR. FEIN: I agree it's very salient, but I guess I'll pick up on something Alex said but I'll say it a little differently. When you have a hammer, everything looks like a nail. I think when you're a PBM everything looks like a drug cost problem. I think part of Alex's challenge is you have some of these products that have much bigger societal impact to even medical cost impact. So some of these analogies I think are a little bit false and lead us down the wrong path. MS. CONTI: Yeah. So I want to pick up what Adam was saying and put it into a slightly larger context, which is the following. We are a very rich country and we are a place, we are a country that values innovation implicitly, in everything that we do. So we want to be able to invest in these type of innovative therapies that fundamentally are going to change a lot of the way that we take care of patients. What I think that is missing or gets lost in the drug price conversation is that we need to make sure the entire system, physicians, hospitals, pharmacies, etcetera, are oriented towards giving patients the best valuable care for them. That may mean fundamentally changing the way in which we pay physicians and hospitals and, frankly, pharma as well. The idea should be we want the most innovative care that's going to provide the most bang for our buck. Some of that's going to be stuff that exists already and some of that's going to be stuff that's new. The siloed approach of paying doctors one fee and hospitals one fee and pharma one fee to take care of a patient that is a full human being, when technology is really altering the inputs that we put into patients to make them well, is just things have to change. MR. ARMSTRONG: Let me ask Alex. How do we design a system that is able to comprehensively look at the patient across the types of care that they need and across the longer timeline? I'm guessing in this room there are not a lot of single payer advocates but, Alex, how do we design something that does that? How do you all design price and work with the various parties to capture the very issue, the long-term cost and value implications we're talking about? MR. AZAR: Yeah. It's very hard. If it were easy, it would have already happened. The issue of say bundles. So let's say you have a medical procedure like a stint. Then you have all of the medicine used in the procedure and used after the procedure. You have a bundled payment for the folks in the procedure, the cardiac rehab, and the pharma company. The very difficult question is how you structure the incentives there so that you lead to an economically and health outcome optimizing solution. You make mistakes there. I mean you really, even the market place makes a lot of mistakes in how you do that and lead to unintended consequences. There are a lot of deals right now that are rather blunderbuss, where payers will say to an integrated system, "Here is our reimbursement rate if you have this generic fil rate versus branded prescriptions." They just make up the number. It's just a financial number but it has a massive financial consequence to that institution as a result, depending on whether they prescribe branded or generic drugs. So let's say they've got a 90% generic fill rate, and if not then their reimbursement levels across their whole health plan on their medical services if they don't achieve that may be cut. So what happens? Then the integrated system pushes down those quotas to the individual doctors and the doctor has a generic fill rate quota that's monitored and he or she gets a bonus payment at the end of the year, like a lot of us, that's based on achieving or not achieving that target. Okay? Now, that all presumes that at the very top of the pyramid there, when that was set, that that was a rational choice and balance, but that it trickles down to the doctor and it trickles down to the doctor sitting with a patient and making a choice about what the right medicine is for that patient. I wish I had an easy answer on how you structure a coherent program for reimbursing for value across all the different players in the channel. I haven't seen it. MR. ARMSTRONG: Let me open this up to the panel. I mean figuring this out, we talked about safe harbors. I mean is this going to take some sort of legislative action or policy change in order to enable the conversations that need to happen between the various parts? MALE VOICE: I think if you just look at Medicaid best price, that sets a floor for the pharmaceutical manufacturers for pricing. Right? So they're looking for safe harbor, correct me if I'm wrong, Alex, to be able to do some experimenting, to see if they can provide value, capture value in other ways. If we got rid of Medicaid best price, that would allow all of us that negotiate for drug prices to get the best possible drug prices from a standpoint of using leverage. So I'm not sure that we so much need safe harbors as Medicare best price setting a floor for prescription drug prices in this country, that no manufacturer wants to go below because then a significant portion of their business, they'd have to lower the price. MALE VOICE 1: Well, it's not just that, the challenge. It is that, but it's the timing challenge also on the value based agreements. As Adam talked about, the execution and implementation of value based agreements is incredibly hard. You have to have a data source. You have to be able to track the data. Then you have to at the end evaluate whether you achieved the value based formula of outcome. The problem is we have to file cost reports, Medicaid cost reports, every quarter that declare our best price and our average manufacturer price according to regulation. Well, if two years later I haven't say lower HBA1C levels that we promised in the value based agreement, and then I have to write a 30% higher rebate check to ESI, what do I do about the previous two years of cost reports that I've put in, on which all these different rebate streams around the country and pricing systems are based? That's the challenge. MALE VOICE 2: I'll say we've been able to put in value based programs the last several years from Hepatitis C where we guaranteed that the adherence rates and the cure rates would be the same. We guaranteed that pricing wouldn't go any more if the patient needed more than their 12 weeks of therapy. We guaranteed that we would pay our customers back for the cost of therapy if the patient didn't complete their treatment. For rheumatoid arthritis, starting in January, 25% on average patients switched therapies during the calendar year because the medication isn't working for them or is causing side effects. These therapy's average list price, $3,000 a prescription. We're going to get the plans back $2,000 a prescription, up to $6,000 a year. That's taking risk on people using the medications appropriately. So it's possible. MALE VOICE 1: And we want to join you in taking that risk. It's really just if the government would get out of the way on that because what it means is we've done deals with a lot of payers on value based but the amount we can put at risk is too small often to be material. It ends up being a little more symbolic than we'd like and I know that Glen would like. MALE VOICE 3: Can I just give you just an example that the CEO of a biotech company shared with me because they have a product and development that they are pretty confident works in about half of the people that take it, but they don't know which half. So it's like advertising I guess. So what they did is they started talking to insurers and had this idea, "What if we just sort of give you the drug for free for three months? And the 50% that it works for, then you start paying for that 50%. Then the other 50% that it didn't work for, you don't owe us anything for it." That exactly crystalizes the problem. All of a sudden your Medicaid best price is zero and you have a problem. So he said we couldn't even get that out of the starting gate. I think that's exactly the kind of situation where you're not just talking about--I think some of things Express Scripts is doing is great. You're taking risk in terms of some of the behavior of the patients, which is a lot of risk. Even if you think about the innovation aspect, where you're talking about these curative products, very expensive products, these very specialized products, it's very hard to think about how do we pay for this thing that might be $100,000 per patient but we have this pricing problem to get it out of the gate. To me that really crystalized the challenge. MR. ARMSTRONG: I want to ask a bit about the list versus net question because this is one of the biggest things that we hear about. It was certainly an early focus for us. It was a big focus for Express when you guys went after the hepatitis C folks. How do we get away from this massive and growing disconnect between list versus net? Because like it or not, I mean as a political issue the list price thing is what patients see. To Alex's point earlier, you have increasingly numbers of people in high deductible plans. We actually have a story coming out tomorrow that I hope everyone will go to Bloomberg.com and read. MR. ARMSTRONG: About the increasing number of people in Obamacare plans who are essentially right in the middle class, not getting heavily subsidized, and are afraid to go and use medical services because they have such high deductibles that the act of using the coverage they have would put them in vast financial difficulty. Those are the very people who are going to end up paying these list prices. How do we get away from that? How do we get to a more sane system of pricing both from a transparency standpoint, from how it is viewed politically, and just in the internal economics of the business that you all do with each other? How do we solve that problem? Paul, you looked over at me, so I'm going to give it to you. It's a dangerous thing to do here. MR. HOWARD: Yeah. Now I'm just perplexed. So I think this is not unique to this industry. Obviously in the hospital sector you have charge master prices. You have enormous pricing variation across hospitals that are across the street from each other. So it isn't just this sector of the healthcare industry that has this problem. It's all over the place. I think one of the ways you begin to address this is moving into these agreements around risk. At the end of the day, if you are both, if you are as the payer and the innovator looking at your clinical and economic data and saying, "Here is the total all in cost for this particular drug and this given indication," and you're willing to bear upside and downside risk, the WAC can go away. I mean you can just say, "This is the price and this is the rebate we'll give you if the drug doesn't perform as advertised." I think to the earlier point about competition I think several of us have made, also if innovators could have more competition around economic data that's not necessarily included in their label but might allow them to compete with other products in different indications, you could have much greater competition not only of course branded drugs head-to-head but perhaps increasing branded drugs and generics, and other approaches. To do that, I think we need to break down a lot of data walls right now that are inhibiting the flow of information in ways that would allow the system to adapt and really, as Rena said, identify the most effective treatment. MR. ARMSTRONG: Rena, why don't we go to you? MS. CONTI: So I think that it's incredibly important for people to realize that under insurance is a real thing now. So I agree with what Alex suggested, that proposals either on the private side or on the public side that really try to alleviate financial stress among patients again and their families who are facing list price or close to it for their drug purchases, which include everyone covered under Part D but also a lot of people who are commercially insured, is incredibly important. So I have been very supportive of thinking through 340B discounts in a different way but also along the same lines thinking about rebates and having those shared with patients at the point of sale. I think that's incredibly important. MALE VOICE: So I'll just make a point. We offer our plans the opportunity to have rebates at the point of sale. They're a little bit problematic from the standpoint of the collection timeline, the rebates coming far after. We've had very few takers. MR. ARMSTRONG: Why is that? Let me ask you, why is that? MR. ARMSTRONG: This is a huge issue. MALE VOICE: It really has to do with the complexity of the calculation because the ones that are doing it are trying to take a fiduciary position. They're having us estimate what the rebate is likely to be without knowing if we're going to collect it on the backend. The pharmacy benefit is real time and at the point of sale. You don't leave the store with the goods unless somebody pays. However, they're increasingly sensitive to the experience of patients with list price in the deductible phase of the benefit. I am confident that we will be able to offer solutions working with pharmaceutical manufacturers, how to help and support these people. I don't think it's going to be in the form of coupons or copay cards for all. There is a reason that those programs are illegal in the federal programs, Medicare and Medicaid, because they induce people to use more expensive drugs than are necessary and subvert the formularies and other cost containment controls that the plans have put in place. Our customers, our plans are sensitive to it. They're not truly interested in profiting from the patient experience in the deductible phase of their benefit. They're interested in using those deductible phase to expose people enough to cost that they are price sensitive shoppers, that they are good consumers. I truly believe that we'll be able to work this through and in not a very long period of time be able to offer solutions in the market that protect people from list prices that they can't afford during the deductible phase of their benefits. MR. FEIN: I guess we're going to come back to the grenade copay cards you just rolled in there. I want to go back to one other point and pick up on something here, which is why I have been writing about something I call the "Gross to Net Bubble," this kind of vast expansion of difference between the list price and the net price. I want to just throw out kind of an example of why I think it's so difficult to unwind it. I'll just use an example. If you have two products that are comparable, that have comparable rebates of let's say 30%, and an admin fee to the PBM of 5%, and one of those products takes a WAC price increase of 10% and one takes a WAC price increase of 5%. Even though the products might be therapeutic equal and have the same rebate and admin fee, the system favors the one that took the higher WAC list price. The PBM makes more money. The wholesaler makes more money. The pharmacy makes more money. The insurer makes more money, as more money gets passed back to them for a rebate. So, for better or worse, we have this very complicated, interconnected, I'll call it a drug channel. MALE VOICE: It's a coin of phrase. MR. FEIN: Coin of phrase. That kind of locks us into this weird incentive system. I've personally been struggling to think how do we break that link and change the nature of the relationship between the parties, so that you could actually get away from incentives to increase WAC price that don't actually even increase the net price the manufacturer gets. Their net price might be flat or down in that system. MALE VOICE: The interesting question would be, in that system that Adam just laid out with all of those incentives, could a pharma company ever actually launch a product with a list price that was the equivalent or better than the net that the system is getting? How would the system react? I don't know because all the incentives in the system are towards the higher list. So what if a drug company said, "Okay, we're changing our WAC to just what our net is and making it that?" It's, number one, not clear that gets passed onto the patient. Number two, it's not clear that the elements of the channel don't choke on that. MALE VOICE 1: Well, I mean to some extent I'd say Myelin is trying sort of an experiment. To simplify a little their launching this authorized generic because they don't want to go back in front of congress. So they have two versions of the product. One version is $600 and has a 50% rebate and one version is $300 and has no rebates. That's the authorized generic. Which one do you want? Different plans might choose different options but they're sort of saying there is two different versions with different pricing models. MALE VOICE 2: For all the criticism that they've taken, it does create an interesting solution for a cash paying customer, to a certain extent. MALE VOICE 3: Yeah. It absolutely does. MS. CONTI: So up until now we've been talking about drugs lumped together, but I think there is some traction that could be made in the Part B or the infusion injection space that we haven't quite touched on yet. So these are drugs that have high list price. They're reimbursed off of an average sales price that doesn't take into account all of the discounts and rebates that are probably the most important in the system. Physicians and hospitals make money off the difference between this average sales price and the acquisition costs that they face, which can be quite dramatically lower. In a world that we're living in now, which is Part B reimbursement change where physicians and hospitals are moving towards value based contracting where they're going to be reimbursed for again taking care of the whole patient on pathways or episode based payment and some other way where there is a value payment attached to outcomes or being on pathway, there is no reason why that spread on drugs should exist. So if you are being paid for value for patients, then hospitals shouldn't also be able to put on top of that money that they are writing off of pharma. So that's essentially a way of draining some part of the system that could be shared for patients but also shared in other ways. MR. ARMSTRONG: I want to get some questions from the audience but before we do I'm going to enter the cocktail party question portion of the panel and ask it. We have an interesting event coming up on Tuesday. I don't know if everybody has heard. I would like to hear from our panelists what they think realistically a Trump or Clinton presidency would mean for drug pricing in this country. We'll keep it brief because I do want to get to the audience quickly, but we can start our way down at the other end of the table and work down here. Not merely policy, but I am curious about as well the implications of what does it mean to have political pressure on drug pricing. What are the implications of that for the rest of the healthcare system and the players, and the cover it provides for them? Alex, go ahead. MR. AZAR: There is an element of the silly season of elections and people trying to get their name in headlines and get press releases and tweets out. Let's just recognize that. A lot of that dissipates after Tuesday. Attention levels go down on that. So I'm not sure so much of what we're seeing continues. I hope we'll then move into a more thoughtful way of talking about the issue of affordability of medicines for patients and solutions. Most of what I'm talking about are things that I would like the private sector to work together to try to solve. Just the simple fact of the matter is when the government gets involved it is more likely than not to create perverse incentives and unintended consequences, than when the market players can work together, but we have a burden to start working together to figure that out. We're going to work with either side on folks who support innovation, support competition, put the patient at the center of the system. So I don't see revolutionary big changes. I don't see the kind of things that have been talked about making their way through congress under either President, making their way to the President. I think we'll continue to work on this. In terms of political environment, listen, one of the customers that we have when we thing about pricing and value, key constituent stakeholders, is the public. It's the patient. It's the out-of-pocket. So, yes, that is absolutely a factor that one will think about and one will have to consider the external pressures and environment. MS. CONTI: I think there are going to be three things that we'll see. The first is the naming and shaming of pharma but other players that make money off of the system will continue. There is a lot of bad behavior out there and exposing bad behavior sells newspapers. Also, it's remarkably effective in moderating price graph at least in the short term without having to pass legislation. So I think no matter what we'll see it continue. Secondly, if there is any policy movement at the federal level it's going to be focused on patients. So it's easier to focus on out-of-pocket costs than it is to really think through what it means to actually get income growth for middle income patients who are really bearing the brunt of that. It also is exceptionally politically expedient to do so because it looks like you're being anti-corporate without actually taking on the financial industry. Then, third, I believe that California Proposition 61, which is the drug pricing ballot measure, is just the beginning. I think the states are getting very motivated to try to figure out how they're going to deal with some of these drugs that are coming through and that they're already dealing with. No matter what happens on Tuesday in California, we'll see the states start thinking through more creative options. MR. FEIN: I'll keep it brief. I would say that observing every time I thought the conversation about drug pricing couldn't get any more superficial--I read like a tweet from Bernie Sanders this week and I'm like, "Oh my god." So I think you just sort of have actually two polar extremes. Alex saying there are some sensible things we could do that the system would work through and it would be logical and sensible and good policy. I think Rena is sort of signaling, "Yeah, but we could have really crazy stuff that makes no sense at all, doesn't really solve the problem, makes things demonstrably worse but makes people feel like they did something good." I'm kind of nervous. Although I'd love to believe, Alex, we're going to get there, I'm nervous that Rena could be right and we could end up doing things that are very simple solutions to very complex problems that end up creating many more problems down the line. So I'm kind of vacillating between hope and fear, I'd say. MR. HOWARD: Yeah. I tend to agree with Adam. I think that the rhetoric has become so super charged that it's going to be difficult for the next administration to back down. At the same time, I think a lot of what we've been discussing is going to actually continue to proceed through payment reform through Medicare, through CMMI. They've got what's Part B demo out there that I think Rena alluded to a little bit in terms of what they're doing on the infused drug side. I expect that to continue and get more aggressive if the private sector does not address some of these challenges on its own. We haven't talked about this as an alphabet soup but there is also a user fee agreement that the FDA has to negotiate next year. That's going to depend on congress, and the tone of the debate about drug pricing is really going to be influenced by the makeup of congress. So tell me what congress looks like after Tuesday and then I will have a lot better sense of what's possible. I think this discussion is going to continue to be pressed forward by the big questions around Medicare and Medicaid payment. As Rena said, the states are going to continue to do something if the market doesn't fix it. MALE VOICE: We are already hearing talk of people, of congress using that PDUFA bill as the vehicle for drug price legislation. I think that's kind of the early bet down in Washington, it feels like. MR. STETTIN: So here are some facts, despite what we're hearing about drug prices. For our commercial customers, the employers that pay for prescription drugs, their year-over-year cost, including the cost that their members pay, is up about 3.9% over last year. Right? We can argue that that's still higher than inflation and GDP. Last year, a quarter of those customers had price changes or not price changes but year-over-year costs that include utilization. A quarter had flat or negative. The average member out-of-pocket this year is down 0.9%. That's average. Right? That doesn't mean some people in high deductible plans aren't having real problems. I think regardless of who wins we will be solving that. We can solve that with market solutions that make all of that issue go away. More freedom, though, I think as Alex pointed out with regard to preventive medications and the preventive drug list, so that more employers can have less fear about covering a broader list of drugs first dollar, before the deductible kicks in, will be a big deal. That's a tax regulation issue. You don't need the law necessarily. You just need interpretation or comments about how it's going to be enforced or conducted. MR. ARMSTRONG: I want to bring things open to the audience right now. I think we have some microphones in the room. If you raise your hand someone will come over. Please identify yourself. Say who you are and we always prefer questions to comments. So you, sir, in the back? Yeah. MR. BRUCE STRICTER: Hi. Thank you. It was a great panel discussion, really great speakers today. So I'm Bruce Stricter [phonetic]. I'm with Doctors for America. I just want to ask a question. So it's pointed out earlier that the problem is not the 15% of drug costs. It's the 85% of health services. I mean I think Adam said that and Rena followed up with some comments about the new payments for physicians and hospitals, bundled payments, value based payments. So are you saying that the 85% is not being addressed at all? MALE VOICE: No, I'm not saying the 85% is not being addressed. It's certainly not being talked about. I would argue that part of the challenge is for drugs I think people think, "Well, this is a product with economies of scale and you've spent a lot to develop it, but selling each individual unit costs you nothing." Whereas the other component, particularly let's say physician and hospital services, they're about 60% of healthcare spending, are primarily locally delivered services that are priced locally, where you have a large constituent base. While there is certainly efforts to control those costs, that's a very big source of cost and it's very hard to make services more productive. So it's not that they're not efforts to control that but there is certainly I'd say less discussion and focus on it politically. MR. STRICTER: So you don't think Macros [phonetic] are focused on that, this coming up, a huge change for physician salaries and payments? MALE VOICE: I didn't say no one was focusing on it. I'm saying my observation is that we have a very expensive healthcare system. Physician salaries are much higher. Healthcare procedures cost much more, as do drugs. So to single out drugs as the one design for the public lashing seems disproportionate over indexing on that versus thinking about the system and even some of the issues Alex brought up about total system costs. MR. ARMSTRONG: We'll go to our next question here. Some of these women in the middle here? MR. STETTIN: Yeah. So let me first be clear. We didn't switch people. It was really what therapy they initiated. Right? So for the 25 million lives across a large number of our clients that were part of this particular program, Viekira Pak, the twice a day therapy was the preferred therapy. It was the one that was exclusively covered unless the patient had some particular reason why they could not take that medication safely or it wasn't likely to be effective for them. They also couldn't be on any of the medications that Viekira Pak could interact with or any of those issues. We have pharmacists that specialize in the treatment of hepatitis C at our Accredo Specialty Pharmacy. Those pharmacists were both trained in the use of the medication and they for many years have been trained in adherence support. So the way that we worked this program, the medication for those patients was available exclusively through the Accredo Pharmacy. So we took the risk that we would get them to their full treatment. If it went over and certain patients needed to use therapy for longer than 90 days, we ate the cost. We refunded money if the patients didn't complete their course of therapy. We demonstrated not only did we cut the drug cost in half, we saved our customers an additional--right? Because Gilead, their prices were coming down as well, over $10,000 per treatment, per patient treated who was cured. That's after 50% discount is factored in for the cost of the medicine. We were remarkably effective. MR. STETTIN: It didn't cost any more to the plans to have that. MR. STETTIN: Yeah. You can think about it as trading off. If they were willing to have our pharmacy be the exclusive supplier within their plan for that medication, that was a risk that we were going to bear the cost of all that treatment and the cost of the service that accompanied the medication. MR. ARMSTRONG: Let's go to our next question. Right here. MR. DAVID MUSHER: Hi, I'm David Musher [phonetic]. I'm one of those dinosaurs called a physician. MR. MUSHER: You raise a lot of questions. I only ask one very specific, very narrow question. When you reimburse according to value or when you charge for a medication according to value, how do you distinguish between people who have hepatitis C, who are totally asymptomatic, have had hepatitis C for decades and might well have it for decades more, and would only be picked up on the basis of some sort of a screening test for it, versus somebody who has a bacterial conjunctivitis, who has acute pains in his eyes and is really uncomfortable? How do you determine charging for medication in both of those cases and also reimbursement? MR. ARMSTRONG: I'll throw that open here. Adam, Alex, or Glen, maybe you all can jump in here. MALE VOICE: I mean how we do pricing, it's complex. You look at competitive benchmarks is one. So you look and see what else is out there. It's very challenging then if you were entering first in class, first in a therapeutic area for instance, because you don’t have a benchmark on which to tie. For so many of the incentives in the system that Adam did a really nice job explaining deviating from the benchmarks out there, you need a pretty compelling reason for that deviation. You think about the value out of the overall system in your estimation. You think about offsetting healthcare costs. You think about, as I mentioned before, all stakeholders, including the public, the media, and others, in how they would react. You think about patient out-of-pocket and the impact your pricing will have on that. So it's all of those customer sets and the disease burden and the size of the market. You think about the physician. The physician, even if the physician is not bearing the cost, the physician can have a visceral reaction to various pricing that can actually impact their writing levels. We've seen that in a couple instances in the last couple of years. You have to be very cognizant of that in thinking about your pricing of the medicine. MR. ARMSTRONG: I think your question really does get back to the who captures value because it is a question of when prescribed, when used, and when paid for is the determinate of how value is captured under our current system. So maybe I know we've answered that to a degree but if anybody has an additional thought? MALE VOICE 1: Yeah. So I'll just say we don't set the prices but our job, the reason our customers hire us, is to keep medicines as safe and effective and as affordable as possible. That means lower and lower prices, best prices that we can possible get for our customers. The hepatitis C example, the PCSK9 inhibitors, which what we've done there, we would make a lot more money if we had just gone with the Gilead product. Right? And taken the high prices and not cut the price in half. For the PCSK9 inhibitors, most of the requests that we get for those patients are for people who have not tried high dose statins or don't otherwise qualify based on how the drug was approved and the subset of people who have evidence of benefit. So our customers are looking for us not just on price but on utilization, and trying to make sure that they can continue to have an affordable benefit. The prices, the variable cost of manufacturing that extra dose of hepatitis C is not nearly what the price is in the market. Right? The difference between value and the price it costs to make is pretty different. MALE VOICE 2: Just a quick thought. I think some of the payers have gotten extraordinarily sophisticated. Not to throw the baby out of the bathwater with the high deductible plans, I think there was a research at Harvard. I think it was Ashish Jaw [phonetic] who did a paper not too long ago that noted that part of the reason healthcare spending has slowed is the advent of these higher deductible plans. I think Mercer [phonetic] put out a report last year--or last week, pardon me--that said that employer cost had risen I think by 2.4% or 2.5%, something like that. So they're effective for some things. Other places are obviously leaving patients more exposed. Those are the places actually where we could get much greater value from smarter spending on drugs and other services if we align the incentives but keep the underlying structure of saying, yes, in some places it is effective to allow patients to shop for hip and knee transplants and do other things, for MRIs, that really can save money. MR. ARMSTRONG: I think we have time for about one more question and we have three people who would like to ask one. The gentleman right there I think was the last person with his hand up. Sorry folks. MALE VOICE: Thank you. It seems to me that the system is made much more complex posing where the money flows and when it flows because of rebates. Wouldn't you get a much more transparent and clear market if you force to phase out of rebates, if necessary by law? MR. ARMSTRONG: I think we have two people here who can probably address that pretty directly. MALE VOICE 1: I'll throw in a first. I mean if you have I'll call first party payments, that looks like pretty much every distribution system in the United States. You go to the grocery store, you're spending your money. The grocers decide what to put on the shelf. They bought it from a wholesaler, who bought it from the manufacturer. You can decide, "I'm going to go there and get my Fruity Pebbles and my orange juice and whatever." But if you ask somebody else to pay for it, a third party, which economically makes sense given the incidents of disease, then you have to have some other kind of parallel payment system along with the physical flow in payment. That's the complexity we have of third party payment. So there might be models to get rid of rebates because we've talked about it but you're really kind of going to the heart of what's the notion of someone else paying for it. It's very easy to spend other people's money. MALE VOICE 2: Yeah. I'll just comment that currently rebates are the mechanism by which pharmaceutical manufacturers can offer different prices to different customers. Right? You think about airline seats or hospital stays, customers with more clout pay less, and rebates are the mechanism for doing that. I think that as long as we have the system that we have where different parties are different volume purchasers and have different ability to influence what products get used, you'll have some system for differential value, differential cost or price with the discounting. For us, that's how we're creating value or part of how we're creating value in this current environment. It doesn't matter to us whether it's rebates or some other mechanism. We have the clout and influence to be able to get the best pricing for our customers. MALE VOICE 2: And that's 80% of the prescriptions. MALE VOICE 1: --a whole part of that market which has no rebates because they're generic drugs. So you're really talking about when you have single source product, a government granted monopoly for a particular product. MS. CONTI: So I'll just follow-up and say that we have a system right now where commercial payers but also the Part D beneficiaries are benefiting substantially from the availability of rebates. We have Part D spending is much lower but also is experiencing much lower growth than what we expected when it was first passed, in part because of how effective PBMs and others have been in negotiating these rebates. If we went to a system that was completely transparent in terms of pricing and/or we got rid of rebates, prices would go up. Growth would probably rise. We wouldn’t be paying lower prices above the board. We'd actually probably be paying much higher prices above the board. So transparency may not be the right thing here. MR. ARMSTRONG: I think we can probably wrap it up there. I want to thank a really wonderful panel, a round of applause for everybody, to Alex for his remarks earlier. MR. ARMSTRONG: I have a feeling folks will probably stick around for a few minutes afterwards, so if you have more questions you know what they look like, who they are. Thank you all very much for being here and have a wonderful morning, everybody.